Unitarian Universalist congregations all along in Florida have been picketing with the CIW at Publix Supermarkets, delivering letters to the Publix managers that ask for Publix to come to the Coalition of Immokalee Workers’ table to talk about the tomatoes they buy. Documented cases of slavery have occurred in the fields of two large Florida tomato growers, 6Ls and Pacific. Publix continues to buy from both growers. Publix cites a policy that states they do not get involved in labor issues between those from whom they purchase and their employees. Since when is slavery a labor dispute? Folks in our southwest Florida cluster congregations share that, when speaking with Publix employees, the managers themselves are disappointed that the corporate level will not cooperate. Even Publix employees on the front lines expect better of this corporation (the 4th largest privately-owned company in the United States, recently reported in Forbes Magazine) that claims it cares about its local community. As far as I can tell, Publix officials turning their backs on slavery in Florida tomato fields is far from caring. Money talks. As Publix buys from growers that condone slavery in their fields, this giant supermarket chain is participating in a harvest of shame. This Sunday people of faith from Florida, Unitarian Universalists and all kinds, will gather in Lakeland, FL, home of the corporate headquarters, to send prayers of courage and caring to Publix. We will make our presence known as allies and supporters of the tomato pickers and stand on the side of love. This year for World AIDS Day, our friends at Advocates for Youth, the Center for Health and Gender Equity (CHANGE), the Religious Action Center of Reform Judaism, and SIECUS have organized a petition campaign and blog-a-thon on the Amplify website. From now through December 6th, you can sign the online petition asking President Obama to create an Emergency Plan for AIDS Relief that provide the best and most comprehensive services and information to young people worldwide. Our country’s HIV/AIDS policy must respect the inherent worth and dignity of those who receive our support by giving them the resources they need to lead whole and healthy lives. Sign the petition, and check out the blog-a-thon today! There are many ways that you can commemorate World AIDS Day, including learning more about HIV/AIDS issues in your area and around the world. 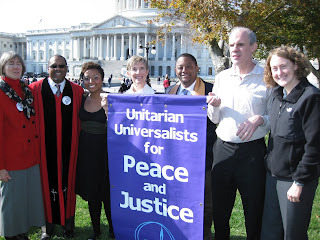 Unitarian Universalists across the United States and Canada are powerful advocates and educators with the UU Global AIDS Coalition. Here in Washington, D.C. there will be a march and rally tomorrow, Tuesday, Dec. 1 at 12:00pm, starting at the White House and ending at 2:00pm at the Wilson Building. RSVP and find more details on Facebook. There will also be a vigil at Dupont Circle at 5:30 pm. Find out what’s happening in your own community for World AIDS Day here. From what I understand of legal and judicial precedent, the Federal government is not supposed to interfere with a woman’s right to choose when, how and under what circumstances to have or not have a child. This includes the right to a safe and legal abortion as under the conditions of the Roe v. Wade United States Supreme Court decision of 1973. Late last Saturday night, this right began unraveling in the House of Representatives. When the vote was over, the House had passed a comprehensive health care reform bill that essentially eliminates a woman’s right to choose abortion. The Stupak-Pitts amendment, which was included in the House bill, makes it illegal for any provider in the proposed health care exchange, the marketplace created for individuals and businesses, or in any public option, to provide abortion coverage. Women would instead be able to purchase an abortion rider, additional coverage for abortion services. Anti-choice groups would have us believe that this is a reasonable compromise, but who would choose to pay extra for a service that they don’t ever expect to use? Women cannot anticipate unintended or untenable pregnancies. Furthermore, in the five states that have abortion rider requirements already, there is no evidence that such riders have ever been made available. Losing the right to purchase abortion coverage with their own funds puts women at risk. Low and middle income women who will need subsidies to purchase insurance, those who are in the greatest need of comprehensive and high quality health care, are left without options. The lives of women and their families literally hang in the balance. The decision to have or not have an abortion should remain between a woman and her doctor; this amendment threatens to revoke the right to that decision and violates the very spirit of health care reform. Health care reform isn’t about promoting one ideology over another, it’s about the legal and moral rights of people to receive the comprehensive health care that they need and deserve – and not to be denied coverage of services that are currently covered by most insurance companies. It’s extremely difficult for me to be happy about reform that doesn’t provide access to comprehensive reproductive health care for millions of women – so I’m not going to be. A health system that doesnt give us access to care we need is inherently unjust and unacceptable. So I’m going to believe that it will not be codified. I’m going to put my faith in the Unitarian Universalists and other champions of reproductive justice out there, and I’m going to believe in the power of advocacy. But I need your help. I can’t do it without you. Please contact your Senators and the White House with a clear message telling them to enact health care reform that does not eliminate services that women already receive, including comprehensive reproductive care, including abortion.